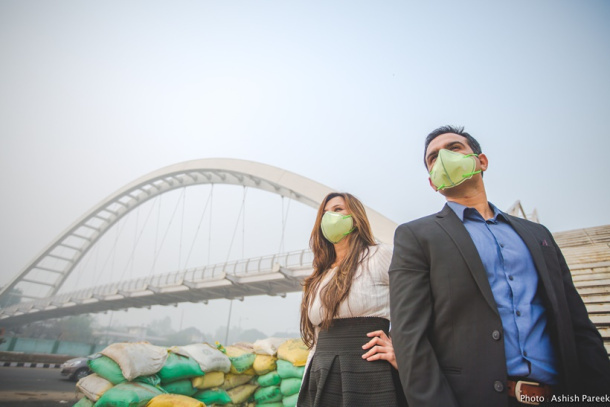 It’s November, again, and the same headlines blanket news outlets in India and the world: air pollution in Delhi has hit dangerous levels. Since last winter, this problem had faded from public concern as had the smog itself until now. 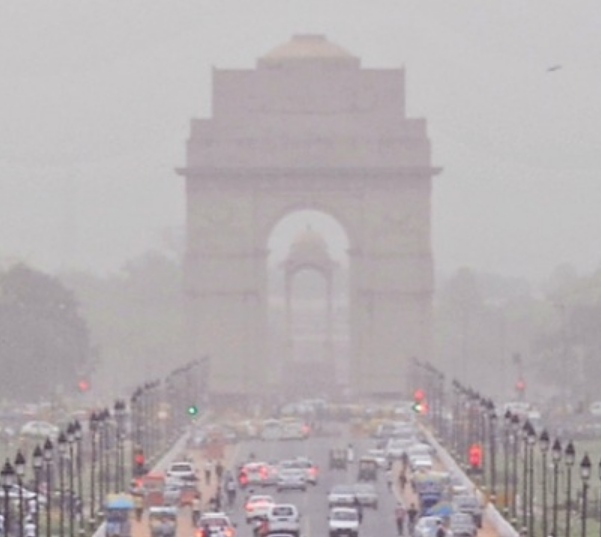 There was no respite for Delhiites from poor air quality as smog continued to engulf the national capital on Sunday. 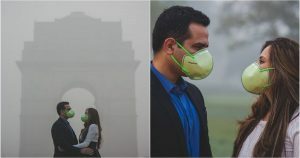 People who went for a morning walk at India Gate were seen wearing masks and said it was tough to breathe and the situation needed to be fixed urgently. The minimum temperature dropped to 13 degrees Celsius. High humidity level at 98 percent contributed to the smog, a MeT department official said. Light rain is expected on November 14-15 which might intensify the fog but could clear the smog, the official said. 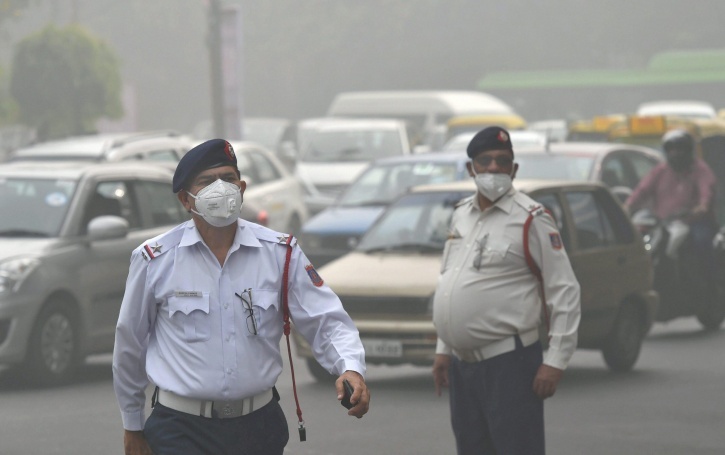 With the rise in air pollution in Delhi, the whole city got under the blanket of heavy smog and is compared to a ‘Gas Chamber’. 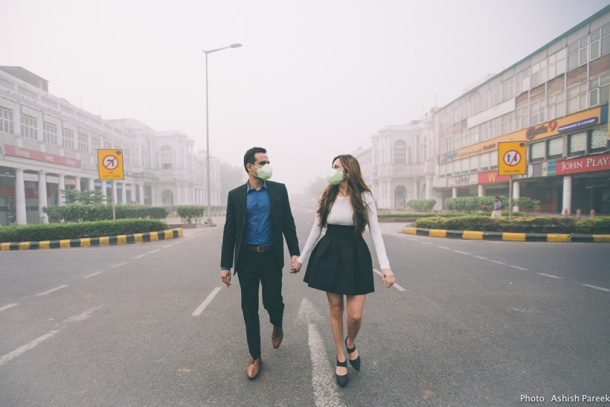 So what happens to Delhi’s charming locations that serve as a prop, canvas, and theme for couple photo shoots? 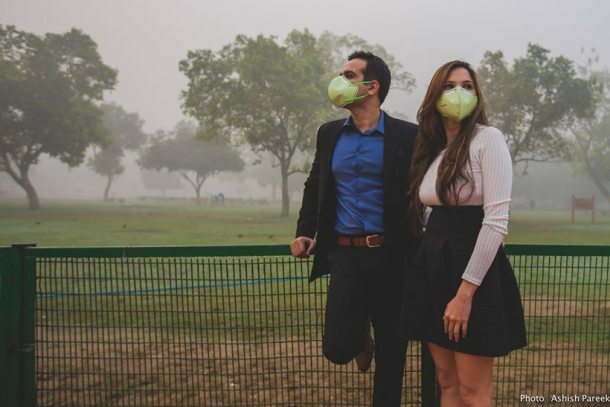 Well, with the love for Delhi’s colorful iconography that has given many couples their dream shots (pictures), one photographer tried to capture the other side (horror) of the changing scenarios, but with a twist! In these photos, a couple was seen celebrating their love wearing masks. 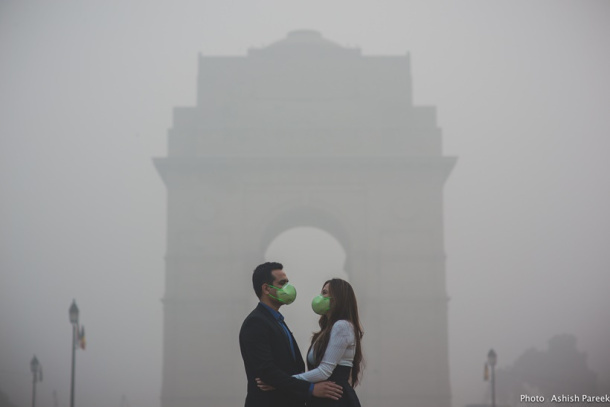 Delhi-based photographer woke up to foggy skies and was nervous. When a client wanted to capture some shots in the city, he was worried about the smog and of course the potential hazards. However, he turned it to his advantage. 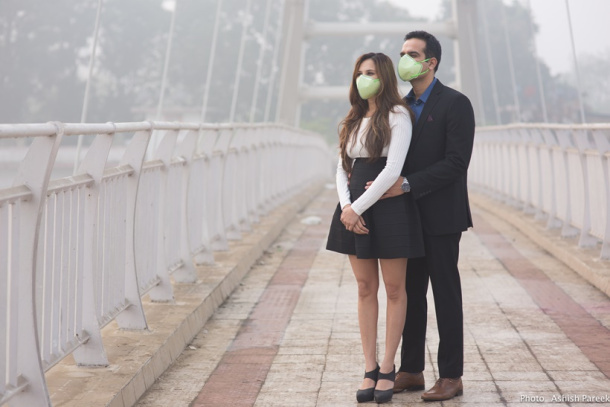 The couple thought a photo shoot in this weather was big ‘No’ without a mask. Hence, he got a crazy idea and turned it into something touching by drawing the attention of viewers online. 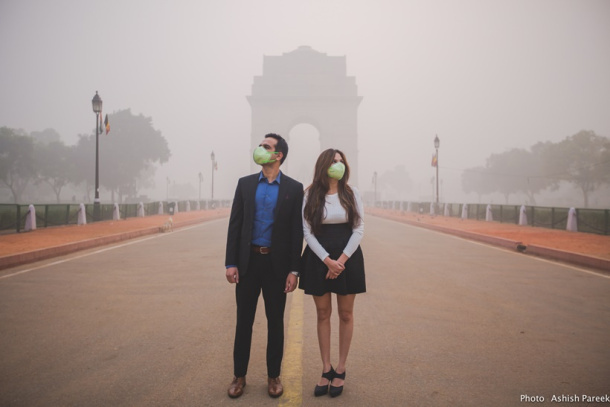 They then went to India Gate in Delhi to capture what ‘Love in the Time of Smog’ would look like. Shooting in that condition in the early morning was difficult and both, the couple and the photographer, were quite on the receiving end. People on social media took notice of his take on the present climatic condition and were deeply moved. While many lauded him for his concept, others feared that it might soon become a horrific reality.